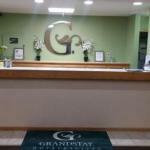 Internet access local calls and continental breakfasts: they're all on the house at the conveniently located Crossings Inn & Suites by GrandStay. The pool and hot tub are also major draws. At the two-story Crossings Inn & Suites the 37 smartly decorated rooms and suites have beds topped with snowy white duvets and down comforters and TVs with cable channels. Keep in touch with free high-speed internet connections and local calls. Mornings begin with waffles one of the hot options at the complimentary breakfast buffet. The heated indoor pool and hot tub are great spots to relax at the end of the day. Parking is free. On the northern edge of Waseca the Crossings Inn & Suites puts you one mile from downtown. The area is dotted with lakes to explore including lovely Crystal Lake. Minutes away is Waseca Water Park a favorite with local families. Rochester International Airport is 64 miles east and Minneapolis-Saint Paul International Airport is 70 miles north.